Edward J. Hackett is vice provost for research and a professor in the Heller School for Social Policy and Management. 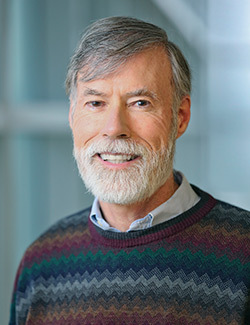 He is responsible for the Office of Research Administration, the Office of Technology Licensing, the Foster Lab (which cares for animal subjects used in research), and Sponsored Program Accounting. From 1997-2015, he was a professor in Arizona State University’s School of Human Evolution and Social Change, with appointments in the School of Sustainability, School of Life Sciences, and Consortium for Science Policy & Outcomes. He was a founding member of the Department of Science and Technology Studies at Rensselaer Polytechnic Institute (1984-98). As a rotator, he directed the NSF Division of Social and Economic Sciences (2006-08), and the Science and Technology Studies program (1996-98). His research, supported by various NSF grants, has mainly focused on the social organization and dynamics of science, peer review and environmental justice. He has published in American Sociological Review, Minerva, Research Policy, Social Studies of Science, Science, Technology & Human Values, and other journals. He was lead editor of the “Handbook of Science and Technology Studies” (MIT Press, 2008), and has been editor of Science, Technology & Human Values since 2012. Ed holds a BA from Colgate University, and an MA and PhD from Cornell University, all in sociology.